Diamonds are a timeless way to express emotion or commemorate a special occasion such as engagement, marriage, anniversary or a special personal treat. 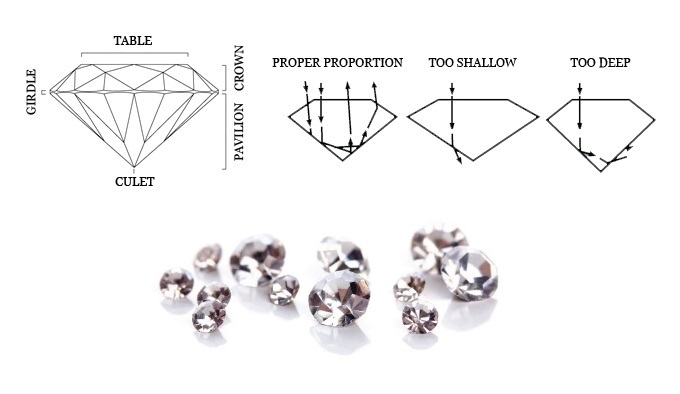 The 4 c's are important when considering any diamond purchase - carat, colour, clarity and cut. It's extremely useful to be aware of each of these aspects before investing in any piece of diamond jewellery. However, don't get too lost in the detail of the diamond. Be sure to consider diamond specification along with other aspects such as the ring setting, the suitability to the wearer's lifestyle and fashion preferences, and most importantly - how the piece makes them feel. Carat denotes the weight of a diamond. While the other aspects mentioned below have a bearing on diamond quality, the carat weight does not. There are 100 points in a single carat, so a diamond weighing 3/4 carat would be a '75 point diamond'. Diamonds of 0.30 - 0.75 carat are very popular for their size and value. Large diamonds are rarer to find in mines than small ones and thus large diamond types are much more valuable. Although weight is one measure of diamond size, the same carat weight diamond can look different in size depending on the type of cut - that is, the visible surface area of a one carat diamond can look bigger or smaller despite both diamonds being the same weight. Therefore we also suggest considering the diameter of the top surface of the diamond to get a true picture of the size. The recent increase in popularity of the oval diamond cut is, in part, due to it's larger appearance for the same diamond weight, given that the cut is shallower, allowing for more surface area. A 1-carat princess cut diamond (which is 5.5 mm across) is actually smaller than a 1-carat round diamond (which is 6.5 mm across). However, the diagonal (corner to corner) length of the princess cut stone is 7.8 mm, so it appears larger. So many factors to consider in size alone! The ideal diamond is completely colorless. Though most diamonds appear colorless, they actually have slight tones of yellow or brown. 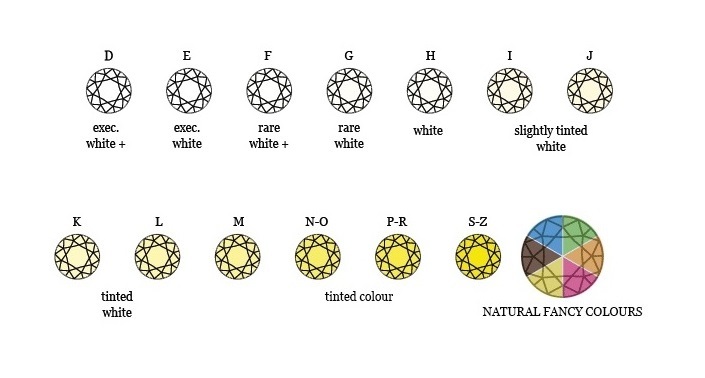 The Gemological Institute of America (GIA), the authority in diamond certification, grades colour alphabetically from D (totally colorless) to Z (heavily tinted). The difference in grades is very subtle, and mostly not visible to the naked eye. A diamond with a visible tint such as J and above can still be beautiful if it has a good clarity and cut. Only diamonds graded N onwards have a tint that is visible to the naked eye. Beyond S the tint grows more intense. Natural fancy diamonds are rarer than white diamonds, and have seen a resurgence in popularity with the yellow diamond being one of the most accessible and therefore on-trend shades. With clarity, the types of diamond are gauged depending on the quantity and visibility of flaws. See our diagram below to show the range of clarities ranging between IF and I3. 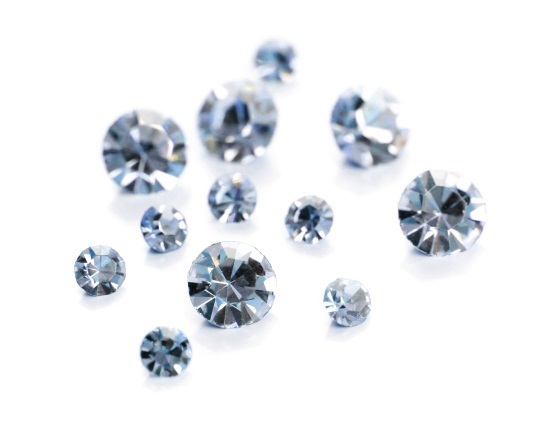 Even though a diamond may have one or more small inclusions, many of these will not be visible unless looking at the stone under magnification. The cut refers to the proportions, finish, symmetry and polish of the diamonds. These factors determine the intensity and brilliance of a diamond. A well-cut diamond is proportioned, symmetrical, and polished; these are typically the most expensive types of diamond. 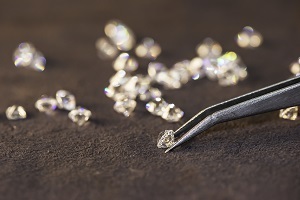 Well-cut diamonds sell at a premium and poorly cut diamonds sell at discounted prices. Cut can also refer to the style of the diamond cut, such as princess cut, round cut, emerald or cushion cut diamonds. 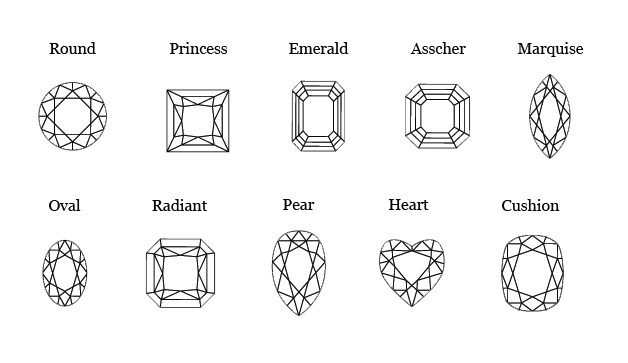 Some of the most popular diamond shapes can be seen below. Round Brilliant is a classic that never goes out of style and is known for its brilliant sparkle. Princess Cut is a more modern classic, and Oval Diamonds are very on-trend in 2019. Cushion Cut is a lovely middle ground between round and square, whereas Emerald Cut often evokes an art deco mood. For something a little different try a Pear or Marquise Cut. Knowing a bit more about diamond qualities and the 4 c's is your secret weapon when shopping around for diamond jewellery. It's also worth remembering that diamond specifications, whilst they greatly impact the retail value of a diamond, can not always be differentiated by the non-expert eye at the distance it is normally seen from - that is, on the hand of a person, constantly moving and not right in front of your face at eye level! So choose the diamond together with setting and the other pieces of jewellery it sits with, such as wedding or eternity ring - and above all, choose something that makes her feel amazing! Read more about your diamond ring experience at Niche Jewellery or contact us to make an appointment or find out more.